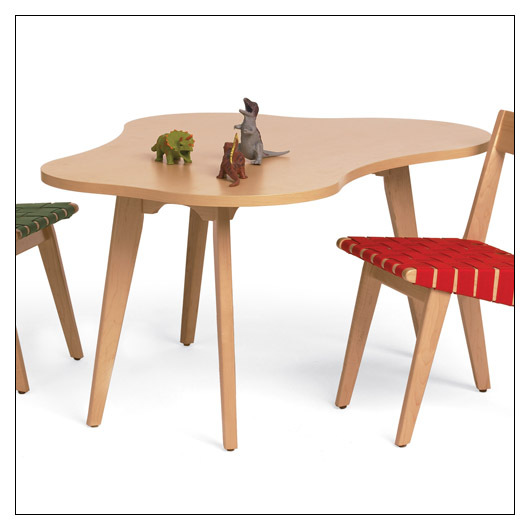 Risom Child's Amoeba Table (msdsfrcat) at Pure Design Kids / Tables and Desks / Tables ::: Kids' Toys, Furniture and More at Pure Design Kids! The Risom Collection exhibits the designer's taste for a well-crafted Scandinavian Modernism. This table is organically shaped for a playful space, but will be comfortable in your living room too! A truly sophisticated choice for mini. ** Tip: The Child's Risom Amoeba Table is compliant to the Consumer Product Safety Improvement Act of 2008. For children's products, 16 C.F.R. 1303, CPSIA Title 1 Section 101 for total lead in substrates and surface coatings. Please allow 5-7 weeks. Since all Knoll products are Made-to-Order, all sales of this item are final. Your credit card will be billed as soon as we get confirmation from Knoll that your order has gone into production. "Lower 48" USA sales only.